This entry was posted on Thursday, November 10th, 2011 at 9:39 am and is filed under Sarayu Yoga. You can follow any responses to this entry through the RSS 2.0 feed. You can leave a response, or trackback from your own site. « After we listen to our life, what next? 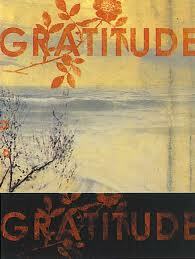 This is the time of year when gratitude takes the center stage. I love having a time of year that the media is focused on being thankful. It is the anthesis of the usual media message. The media seems to be the way to get any message out there. So, I am happy to use it toward a positive end, rather than the usual end of pushing fear. To me, gratitude and simplicity go hand in hand. The less I have, the more I am able to focus on what is in my life, and to be grateful for it. For me, when there is “too much”(stuff, I mean), I cannot focus on what is truly important. This means I am a really lousy consumer and probably single-handedly keeping the recession going! Practicing simplicity takes you out of the mainstream mind set and into the group who is “prolonging the recession”. It’s a choice we make. We are responsible for our own choices. We choose how to invest our time and our precious energy. Why not consider sending yours caring for your body, mind and spirit? Join us November 14 at the UU Church of Fresno on Alluvial in Clovis. We practice yoga from 6:30-8:00pm. Bring yourself and your grateful heart!